This is the home page of Dr. Daniel Keysers, currently Staff Software Engineer at Google Switzerland, Zurich. At Google, I worked on YouTube Content-ID, Online Handwriting Recognition, and Natural Language Understanding. Before joining Google in November 2007, I was a Senior Researcher at the German Research Center for Artificial Intelligence (DFKI), Image Understanding and Pattern Recognition Group (IUPR), where I lead various projects in the area of document image understanding, OCR, and image and video retrieval. Before joining the DFKI in May 2005, I was a research assistant, a PhD student, and the head of the image recognition group at the Chair of Computer Science VI at RWTH Aachen University, Germany. V. Carbune, D. Keysers, T. Deselaers. Simplified voice-based interaction by inferring user intent. Technical Disclosure Commons, published March 2019. V. Carbune, D. Keysers, T. Deselaers. Predicted Image-Capture Device Settings through Machine Learning. Technical Disclosure Commons, published March 2019. V. Carbune, D. Keysers, T. Deselaers. Visual User Interface Interaction Prediction. Technical Disclosure Commons, published February 2019. D. Keysers, T. Deselaers, V.Carbune. Detecting extraneous social media messages. US Patent App. 15/380,748, published June 2018. V. Carbune, D. Keysers, T. Deselaers. Smart assist for repeated actions. US Patent App. 15/383,966, published June 2018. D. Keysers, T. Deselaers, V.Carbune. Dynamically merging multiple screens into one view port. US Patent US14671789, published May 2018. T. Deselaers, V.Carbune, P. Gonnet, D. Keysers. Enhanced Communication Assistance with Deep Learning. US Patent App. US20180137400A1, published May 2018. V.Carbune, T. Deselaers, D. Keysers. Third party application configuration for issuing notifications. US Patent App. US20180131655A1, published May 2018. V. Carbune, D. Keysers, T. Deselaers. Using textual input and user state information to generate reply content to present in response to the textual input. US Patent US20180061400A1, published March 2018. V. Carbune, S. Feuz, D. Keysers, T. Deselaers. Incremental sharing using machine learning. Technical Disclosure Commons, published January 2018. V. Carbune, D. Keysers, T. Deselaers. Context based automatic email responses. Technical Disclosure Commons, published November 2017. T. Deselaers, D. Keysers. Automatic correction of timestamp and location information in digital images. Technical Disclosure Commons, published August 2017. T. Deselaers, D. Keysers, S. Gammeter, M. Sharifi. Wireless Signal Forwarding. US Patent US9699597, issued July 2017. D. Keysers, T. Deselaers, H.A. Rowley, L.-L. Wang, V. Carbune. Multi-Language Online Handwriting Recognition. In IEEE Transactions on Pattern Analysis and Machine Intelligence, Volume 39, Issue 6, pages 1180-1194, June 2017. V. Carbune, D. Keysers, T. Deselaers. Smart Layout For Printing. Technical Disclosure Commons, published April 2017. T. Deselaers, D. Keysers. Interactive display of high dynamic range images. US Patent US9594488, published March 2017. T. Deselaers, D. Keysers, V. Carbune. Smart Button Actions On Mobile Devices. Technical Disclosure Commons, published March 2017. V. Carbune, D. Keysers, T. Deselaers. Automated Application Permissions Setting. Technical Disclosure Commons, published October 2016. D. Keysers, T. Deselaers. Promotion and demotion of posts in social networking services. US Patent US9454519B1, published September 2016. T. Deselaers, D. Keysers, V. Carbune. Smart Screen Rotation Detection for Mobile Devices. Technical Disclosure Commons, published August 2016. T. Deselaers, D. Keysers, D. Genzel, A. Popat. Text Recognition Based on Recognition Units. US Patent US20150186738, published July 2015, issued January 2017. D. Keysers, T. Deselaers, H. Rowley. Partial Overlap and Delayed Stroke Input Recognition. US Patent US20150169950, published June 2015. D. Keysers, T. Deselaers, H. Rowley. Segmentation of Devanagari-Script Handwriting for Recognition. US Patent US20150169949, published June 2015; issued February 2016. T. Deselaers, D. Keysers. Interactive display of high dynamic range images. Patent WO2015088910, published June 2015. T. Deselaers, D. Keysers. Collaborative e-mail. US Patent US20150156153, June 2015. T. Deselaers, D. Keysers, J. Hosang, H.A. Rowley. GyroPen: Gyroscopes for Pen-Input with Mobile Phones. In IEEE Transactions on Human-Machine Systems Volume 45, Number 2, pages 263-271, April 2015. T. Deselaers, D. Keysers, H.A. Rowley, L.L. Wang, V. Carbune, A. Popat, D. Narayanan. Google Handwriting Input in 82 languages on your Android mobile device. Google Research Blog, April 2015. T. Deselaers, D. Kohler, D. Keysers, M. Sharifi, R. Cohen, B. Boissinot, S. Gammeter. System to integrate real-world objects into social networks. US Patent 20140188742, issued July 2014. F. Och, T. Deselaers, D. Keysers, H. Rowley. Progress display of handwriting input. US Patent 20140188742, issued March 2014. D. Marwood, D. Keysers, R. Tucker, G. Postelnicu, M. Covell. Large-scale matching of audio and video. US Patent 8625033, issued January 2014. T. Deselaers, D. Keysers. Method and system for deep links in application contexts. US Patent 8510764, issued August 2013. D. Keysers, T. Deselaers. Motion estimation for mobile device user interaction. US Patent 8194926, issued June 2012. D. Keysers. Sometimes it’s easier just to write it. Google Translate Blog, January 2012. F. Shafait, D. Keysers, T. Breuel. Response to "Projection Methods Require Black Border Removal". In IEEE Transactions on Pattern Analysis and Machine Intelligence, Volume 31, Number 4, pages 763-764, Apr 2009. F. Shafait, J. van Beusekom, D. Keysers, T. Breuel. Background Variability Modeling for Statistical Layout Analysis. In ICPR 2008, 19th Int. Conf. on Pattern Recognition, Tampa, Florida, December 2008. J. van Beusekom, F. Shafait, D. Keysers, T. Breuel. Document Cleanup Using Page Frame Detection. In IJDAR, Int. Journal on Document Analysis and Recognition, Volume 11, Issue 2, Pages 81-96, October 2008. F. Shafait, J. van Beusekom, D. Keysers, T. Breuel. Structural Mixtures for Statistical Layout Analysis. In DAS 2008, 8th Int. Workshop on Document Analysis Systems, Nara, Japan, September 2008. A. Ulges, C. Schulze, D. Keysers, T. Breuel. Identifying Relevant Frames in Weakly Labeled Videos for Training Concept Detectors. In CIVR 2008, ACM International Conference on Image and Video Retrieval, Niagara Falls, Canada, July 2008. F. Shafait, D. Keysers, T. Breuel. Performance Evaluation and Benchmarking of Six Page Segmentation Algorithms. In IEEE Transactions on Pattern Analysis and Machine Intelligence, Volume 30, Number 6, pages 941-954, June 2008. M. Renn, J. van Beusekom, D. Keysers, T. Breuel. Automatic Image Tagging using Community-Driven Online Image Databases. In AMR 2008, 6th International Workshop on Adaptive Multimedia Retrieval, Berlin, Germany, June 2008. A. Ulges, C. Schulze, D. Keysers, T. Breuel. A System that Learns to Tag Videos by Watching Youtube. In ICVS 2008, 6th International Conference on Computer Vision Systems, Santorini, Greece, May 2008. F. Shafait, D. Keysers, T. Breuel. Efficient Implementation of Local Adaptive Thresholding Techniques Using Integral Images. In Document Recognition and Retrieval XV, IS&T/SPIE Annual Symposium on Electronic Imaging, San Jose, CA, January 2008. D. Keysers, M. Renn, T. Breuel. Improving Accessibility of HTML Documents by Generating Image-Tags in a Proxy . In ACM ASSETS 2007, Ninth International ACM SIGACCESS Conference on Computers and Accessibility, Tempe, Arizona, pages 249-250, October 2007. M. Krämer, H. Kaprykowsky, D. Keysers, T. Breuel. Bibliographic Meta-Data Extraction Using Probabilistic Finite State Transducers. In ICDAR 2007, 9th International Conference on Document Analysis and Recognition, Curitiba, Brazil, volume II, pages 609-613, September 2007. J. van Beusekom, D. Keysers, F. Shafait, T. Breuel. Example-Based Logical Labeling of Document Title Page Images. In ICDAR 2007, 9th International Conference on Document Analysis and Recognition, Curitiba, Brazil, volume II, pages 919-923, September 2007. A. Ulges, C. Schulze, D. Keysers, T. Breuel. Content-based Video Tagging for Online Video Portals. In MUSCLE Workshop 2007, Third MUSCLE / ImageCLEF Workshop on Image and Video Retrieval Evaluation, Budapest, Hungary, September 2007. A. Ulges, C. Lampert, D. Keysers, T. Breuel. Optimal Dominant Motion Estimation using Adaptive Search of Transformation Space. In DAGM 2007, 29th Annual Symposium of the German Association for Pattern Recognition, Heidelberg, Germany, LNCS volume 4713, pages 204-213, September 2007. D. Keysers, T. Deselaers, T. Breuel. Optimal Geometric Matching for Patch-Based Object Detection. In Electronic Letters on Computer Vision and Image Analysis, Volume 6, Issue 1, pages 44-54, June 2007. F. Shafait, J. van Beusekom, D. Keysers, and T. Breuel. Page Frame Detection for Marginal Noise Removal from Scanned Documents. In SCIA 2007, 15th Scandinavian Conference on Image Analysis, Aalborg, Denmark, pages 651-660, June 2007. D. Keysers. Variabilitätsmodellierung für die Bilderkennung (in German). In Ausgezeichnete Informatikdissertationen 2006, GI Lecture Notes in Informatics (LNI), Proceedings of the Dissertationspreis-Kolloquium, Dagstuhl, Germany, pages 117-128, May 2007. D. Keysers, F. Shafait, and T. Breuel. Document Image Zone Classification - A Simple High-Performance Approach. In VISAPP 2007, 2nd International Conference on Computer Vision Theory and Applications, Barcelona, Spain, pages 44-51, March 2007. T. Deselaers, A. Hegerath, D. Keysers, H. Ney. Sparse Patch-Histograms for Object Classification in Cluttered Images. In DAGM 2006, Pattern Recognition, 28th DAGM Symposium, Berlin, Germany, LNCS volume 4174, pages 202-211, September 2006. F. Shafait, D. Keysers, and T. Breuel. Pixel-Accurate Representation and Evaluation of Page Segmentation in Document Images. In ICPR 2006, International Conference on Pattern Recognition, Hong Kong, China, pages 872-875, August 2006. D. Keysers. Comparison and Combination of State-of-the-art Techniques for Handwritten Character Recognition: Topping the MNIST Benchmark. Technical Report, IUPR Research Group, DFKI and Technical University of Kaiserslautern, May 2006. P. Dreuw, T. Deselaers, D. Keysers, H. Ney. Modeling Image Variability in Appearance-Based Gesture Recognition. In ECCV-SMVP, 3rd Workshop on Statistical Methods in Multi-Image and Video Processing, Graz, Austria, pages 7-18, May 2006. J. van Beusekom, D. Keysers, F. Shafait, T. Breuel. Distance Measures for Layout-Based Document Image Retrieval. In DIAL 2006, 2nd IEEE International Conference on Document Image Analysis for Libraries, Lyon, France, pages 232-242, April 2006. P. Dreuw, T. Deselaers, D. Rybach, D. Keysers, H. Ney. Tracking Using Dynamic Programming for Appearance-Based Sign Language Recognition. In FG 2006, 7th International Conference Automatic Face and Gesture Recognition, Southampton, UK, pages 293-298, April 2006. M. Everingham, A. Zisserman, C. Williams, L. Van Gool, M. Allan, C. Bishop, O. Chapelle, N. Dalal, T. Deselaers, G. Dorko, S. Duffner, J. Eichhorn, J. Farquhar, M. Fritz, C. Garcia, T. Griffiths, F. Jurie, D. Keysers, M. Koskela, J. Laaksonen, D. Larlus, B. Leibe, H. Meng, H. Ney, B. Schiele, C. Schmid, E. Seemann, J. Shawe-Taylor, A. Storkey, S. Szedmak, B. Triggs, I. Ulusoy, V. Viitaniemi, and J. Zhang. The 2005 PASCAL Visual Object Classes Challenge. In Machine Learning Challenges. First PASCAL Machine Learning Challenges Workshop, MLCW 2005, Southampton, UK, April 11-13, 2005, Revised Selected Papers. LNCS volume 3944, pages 117-176, April 2006. F. Shafait, D. Keysers, and T. Breuel. Performance Comparison of Six Algorithms for Page Segmentation. In DAS 2006, 7th IAPR Workshop on Document Analysis Systems, Nelson, New Zealand, LNCS volume 3872, pages 368-379, February 2006. T. Breuel and D. Keysers. Round-Trip HTML Rendering and Analysis for Testing, Indexing, and Security. In DAS 2006, 7th IAPR Workshop on Document Analysis Systems, Nelson, New Zealand, February 2006. Extended abstract. D. Keysers, C. Lampert, and T. Breuel. Color Image Dequantization by Constrained Diffusion. In SPIE EI 2006, IS&T/SPIE 18th Annual Symposium Electronic Imaging, Vol. 6058 of Proc. SPIE, pages 6058.03.01-6058.03.10, San Jose, CA, January 2006. J. Strackeljan, R. Jonscher, S. Prieur, D. Vogel, T. Deselaers, D. Keysers, A. Mauser, I. Bezrukov, and A. Hegerath. GfKl Data Mining Competition 2005: Predicting Liquidity Crises of Companies. In From Data and Information Analysis to Knowledge Engineering. Proceedings of the 29th Annual Conference of the Gesellschaft für Klassifikation e.V. 2005, Magdeburg, Germany, pages 748-758, 2006. T. Deselaers, T. Weyand, D. Keysers, W. Macherey, and H. Ney. FIRE in ImageCLEF 2005: Combining Content-based Image Retrieval with Textual Information Retrieval, Working Notes of the CLEF Workshop, Vienna, Austria, September 2005. T. Deselaers, D. Rybach, P. Dreuw, D. Keysers, and H. Ney. Face-based Image Retrieval: One Step Toward Object-based Image Retrieval. MUSCLE/ImageCLEF workshop 2005, Vienna, Austria, September 2005. T. Deselaers, D. Keysers, and H. Ney. Improving a Discriminative Approach to Object Recognition using Image Patches. In DAGM 2005, Pattern Recognition, 27th DAGM Symposium, Vienna, Austria, LNCS volume 3663, pages 326-333, August/September 2005. M. Zahedi, D. Keysers, T. Deselaers, and H. Ney. Combination of Tangent Distance and Image Distortion for Appearance-Based Sign Language Recognition. In DAGM 2005, Pattern Recognition, 27th DAGM Symposium, Vienna, Austria, LNCS volume 3663, pages 401-408, August/September 2005. C. Lampert, T. Braun, A. Ulges, D. Keysers, and T. Breuel. Oblivious Document Capture and Real-Time Retrieval. In CBDAR 2005, International Workshop on Camera-Based Document Analysis and Recognition. Seoul, South Korea, pages 79-86, August 2005. D. Keysers and T. Breuel. Optimal Line and Arc Detection on Run-Length Representations. In GREC 2005, Sixth International IAPR Workshop on Graphics Recognition. Hong Kong, China, pages 17-23, August 2005. T. Deselaers, D. Keysers, and H. Ney. Discriminative Training for Object Recognition Using Image Patches. In CVPR 2005, International Conference on Computer Vision and Pattern Recognition, San Diego, CA, volume II, pages 157-162, June 2005. M. Zahedi, D. Keysers, and H. Ney. Appearance-Based Recognition of Words in American Sign Language. In IbPRIA 2005, 2nd Iberian Conference on Pattern Recognition and Image Analysis, Estoril, Portugal, LNCS volume 3522, pages 511-519, June 2005. M. Zahedi, D. Keysers, and H. Ney. Pronunciation Clustering and Modeling of Variability for Appearance-Based Sign Language Recognition. In GW 2005, 6th International Workshop on Gesture in Human-Computer Interaction and Simulation, Volume LNCS 3881 of Lecture Notes in Computer Science, pages 68-79, Ile-de-Berder, France, May 2005. P. Dreuw, D. Keysers, T. Deselaers, and H. Ney. Gesture Recognition Using Image Comparison Methods. In GW 2005, 6th International Workshop on Gesture in Human-Computer Interaction and Simulation, Volume LNCS 3881 of Lecture Notes in Computer Science, pages 124-128, Ile-de-Berder, France, May 2005. D. Rybach, D. Keysers, and H. Ney. Erweiterung eines holistischen statistischen Bilderkenners zur Verwendung von mehreren Merkmalen (in German). In Informatiktage 2005 der Gesellschaft für Informatik, St. Augustin, Germany, pages 155-158, April 2005. T. Deselaers, D. Keysers, and H. Ney. FIRE - Flexible Image Retrieval Engine: ImageCLEF 2004 Evaluation. In CLEF 2004 Workshop. Bath, UK, pages 535-544, September 2004. Paper in the Proceedings published in Springer LNCS: T. Deselaers, D. Keysers, and H. Ney. FIRE - Flexible Image Retrieval Engine: ImageCLEF 2004 Evaluation. In CLEF 2004, LNCS 3491, Bath, UK, pages 688-698, September 2004, printed 2005. D. Keysers, T. Deselaers, and H. Ney. Pixel-to-Pixel Matching for Image Recognition using Hungarian Graph Matching. In DAGM 2004, Pattern Recognition, 26th DAGM Symposium, Tübingen, Germany, volume LNCS 3175 of Lecture Notes in Computer Science, pages 154-162, August/September 2004. This paper received one of the four "DAGM Prizes" (best paper awards) at the conference. T. Deselaers, D. Keysers, and H. Ney. Features for Image Retrieval: A Quantitative Comparison. In DAGM 2004, Pattern Recognition, 26th DAGM Symposium, Tübingen, Germany, volume LNCS 3175 of Lecture Notes in Computer Science, pages 228 - 236, August/September 2004. T. Lehmann, M. Güld, C. Thies, B. Fischer, K. Spitzer, D. Keysers, H. Ney, M. Kohnen, H. Schubert, and B. Wein. Content-based Image Retrieval in Medical Applications. In Methods of Information in Medicine, volume 43, number 4, pages 354-361, 2004. T. Lehmann, M. Güld, D. Keysers, H. Schubert, M. Kohnen, and B. Wein. Determining the view of chest radiographs. Journal of Digital Imaging, volume 16, Issue 3, pages 280-291, December 2003. S. Molau, D. Keysers, and H. Ney. Matching Training and Test Data Distributions for Robust Speech Recognition. Speech Communication, volume 41, Issue 4, pages 579-601, November 2003. T. Deselaers, D. Keysers, and H. Ney. Clustering Visually Similar Images to Improve Image Search Engines. In Informatiktage 2003 der Gesellschaft für Informatik, Bad Schussenried, Germany, November 2003. T. Deselaers, D. Keysers, R. Paredes, E. Vidal, and H. Ney. Local Representations for Multi-Object Recognition. In DAGM 2003, Pattern Recognition, 25th DAGM Symposium, Magdeburg, Germany, volume LNCS 2781 of Lecture Notes in Computer Science, pages 305-312, September 2003. ©Springer-Verlag. D. Keysers, R. Paredes, E. Vidal, and H. Ney. Comparison of Log-Linear Models and Weighted Dissimilarity Measures. In IbPRIA 2003, 1st Iberian Conference on Pattern Recognition and Image Analysis, Puerto de Andratx, Spain, volume LNCS 2652 of Lecture Notes in Computer Science, Springer-Verlag, pages 370-377, June 2003. D. Keysers, F.J. Och, and H. Ney. Efficient Maximum Entropy Training for Statistical Object Recognition. In Informatiktage 2002 der Gesellschaft für Informatik, Bad Schussenried, Germany, pages 342-345, November 2002. D. Keysers, F.J. Och, and H. Ney. Maximum Entropy and Gaussian Models for Image Object Recognition. In DAGM 2002, Pattern Recognition, 24th DAGM Symposium, Zürich, Switzerland, volume LNCS 2449 of Lecture Notes in Computer Science, Springer-Verlag, pages 498-506, September 2002. ©Springer-Verlag. S. Molau, F. Hilger, D. Keysers, and H. Ney. Enhanced Histogram Normalization in the Acoustic Feature Space. In ICSLP 2002, 7th International Conference on Spoken Language Processing, Denver, CO, pages 1421-1424, September 2002. D. Keysers, S. Celik, H. Braess, J. Dahmen, and H. Ney. Parameter Estimation for Automatic Dose Control in Radioscopy. In BVM 2002, Bildverarbeitung für die Medizin 2002, Leipzig, Germany, pages 279-282, March 2002. R. Paredes, D. Keysers, T. Lehmann, B.B. Wein, H. Ney, and E. Vidal. Classification of Medical Images using Local Representations. In BVM 2002, Bildverarbeitung für die Medizin 2002, Leipzig, Germany, pages 171-174, March 2002. D. Keysers, J. Dahmen, H. Ney, and M.O. Güld. A Statistical Framework for Multi-Object Recognition In Informatiktage 2001 der Gesellschaft für Informatik, Bad Schussenried, Germany, pages 73-76, October 2001. W. Macherey, D. Keysers, J. Dahmen, and H. Ney. Improving Automatic Speech Recognition Using Tangent Distance. In Eurospeech 2001, 7th European Conference on Speech Communication and Technology. Aalborg, Denmark, pages 1825-1828, volume III, September 2001. D. Keysers, J. Dahmen, and H. Ney. Invariant Classification of Red Blood Cells. In BVM 2001, Bildverarbeitung für die Medizin 2001, Lübeck, Germany, pages 367-371, March 2001. J. Dahmen, D. Keysers, M. Motter, H. Ney, T. Lehmann, and B.B. Wein. An Automatic Approach to Invariant Radiograph Classification. In BVM 2001, Bildverarbeitung für die Medizin 2001, Lübeck, Germany, pages 337-341, March 2001. D. Keysers. Invariante Objekterkennung (in German). In Informatiktage 2000 der Gesellschaft für Informatik, Bad Schussenried, Germany, pages 67-69, October 2000. D. Keysers, J. Dahmen, and H. Ney. A Probabilistic View on Tangent Distance. In Mustererkennung 2000, 22. DAGM Symposium, Springer, Kiel, Germany, pages 107-114, September 2000. J. Dahmen, D. Keysers, M. Pitz, and H. Ney. Structured Covariance Matrices for Statistical Image Object Recognition. In Mustererkennung 2000, 22. DAGM Symposium, Springer, Kiel, Germany, pages 99-106, September 2000. D. Keysers. Approaches to Invariant Image Object Recognition. Diploma thesis, Lehrstuhl für Informatik VI, RWTH Aachen, Aachen, June 2000. J. Dahmen, T. Theiner, D. Keysers, H. Ney, T. Lehmann, and B.B. Wein. Classification of Radiographs in the `Image Retrieval in Medical Applications' System (IRMA). In Proceedings of the 6th International RIAO Conference on Content-Based Multimedia Information Access, Paris, France, pages 551-566, April 2000. D. Keysers. Texturanalyse von Farbbildern mit Gaborfiltern (in German). Research project, Institute of Medical Informatics, Medical Faculty, RWTH Aachen, Aachen, 1999. D. Keysers. Online Handschrifterkennung bei Google. Festkolloquium anlässlich des 20-jährigen Bestehens des Lehrstuhls für Informatik 6. July 5, 2013. D. Keysers. Modeling of Image Variability for Recognition. Talk in the Informatik Kolloquium Series of the TU Kaiserslautern. Kaiserslautern, June 25, 2007. D. Keysers. Improving Face-Detection Accuracy using Context. Talk at Microsoft Research/Live Labs, Redmond, WA, October 13, 2006. D. Keysers. Modeling of Image Variability for Recognition. Talk during the Olympus Prize ceremony at the DAGM 2006, Berlin, September 12, 2006. D. Keysers. Image-Based Personal Computing Technologies and Modeling of Image Variability for Recognition. Talk at the Instituto Tecnológico de Informática (ITI) and the Technical University UPV, Valencia, Spain, May 29, 2006. D. Keysers and T. Breuel. Image-Based Personal Computing Tools. 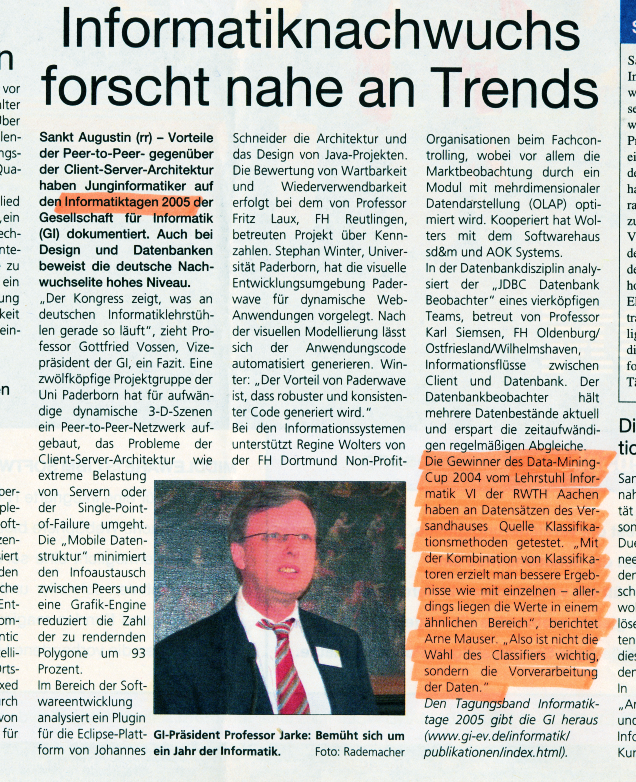 BMBF project presentation, Kaiserslautern, Germany, April 4, 2006. D. Keysers. Modeling of Image Variability for Recognition. Talk (PhD defense), RWTH Aachen University, Aachen, Germany, March 14, 2006. D. Keysers. Studiengang Informatik an der TU Kaiserslautern und Einführung in die Mustererkennung und Bildverarbeitung (in German). Talk for final year high-school students at the Herzog-Johann-Gymnasium, Simmern (Hunsrück), Germany, February 3, 2006. D. Keysers. Bildverstehen II - Mustererkennung und Anwendungen (in German). Talk at Schloss Dagstuhl, Germany, December 8, 2005. D. Keysers. Modeling of Image Variability for Recognition. Talk at the Chair of Pattern Recognition and Image Processing, University of Freiburg, Germany, September 16, 2005. D. Keysers. Modeling of Image Variability for Recognition. PhD-seminar presentation at the Lehrstuhl für Informatik VI, RWTH Aachen, Germany, June 24, 2005. D. Keysers. Modeling of Image Variability for Recognition. Talk at the Research Centre Jülich, Institute of Medicine, Jülich, Germany, April 18, 2005. D. Keysers. Modeling of Image Variability for Recognition. Talk at the Philips Research Labs, Aachen, Germany, March 16, 2005. D. Keysers. Modeling of Image Variability for Recognition. Talk at the University of York, York, UK, February 23, 2005. D. Keysers. Modeling of Image Variability for Recognition. Talk at the Technical University Darmstadt, Darmstadt, Germany, February 21, 2005. D. Keysers. Nonlinear Matching with Local Context for Handwritten Character Recognition. Talk at the DFKI/University of Kaiserslautern, Kaiserslautern, Germany, February 8, 2005. M. Zahedi, D. Keysers, and H. Ney. Appearance-Based Recognition of Signs in American Sign Language. Poster presentation at the 5th Sign Language Workshop of the RWTH Aachen University, Aachen, Germany, October 29, 2004. D. Keysers. From Content-Based Image Retrieval to Image Recognition with Non-Linear Matching. Talk at the Google labs, Mountain View, CA, September 23, 2004. D. Keysers. From Content-Based Image Retrieval to Image Recognition with Non-Linear Matching. Talk at UCLA, Los Angeles, CA, September 16, 2004. H. Müller and D. Keysers. Tutorial on Medical Image Retrieval. MedInfo 2004, 11th World Congress on Medical Informatics, San Francisco, CA, September 8, 2004. D. Keysers. Image Matching for Object Recognition. PhD-seminar presentation at the Lehrstuhl für Informatik VI, RWTH Aachen, Germany, June 9, 2004. D. Keysers, F.J. Och, H. Ney, and R. Paredes. Efficient Maximum Entropy and Discriminative Training. PhD-seminar presentation at the Lehrstuhl für Informatik VI, RWTH Aachen, Germany, November 19, 2002. D. Keysers, F. J. Och, H. Ney, and R. Paredes. Efficient Maximum Entropy and Gaussian Models (for Image Object Recognition). Talk at the Instituto Tecnológico de Informática (ITI), Technical University UPV, Valencia, Spain, October 29, 2002. D. Keysers, J. Dahmen, and H. Ney. Image Recognition using Statistical Methods and Tangent Vectors. Talk at the University of Castilla-La Mancha, Albacete, Spain, February 20, 2002. D. Keysers. Classification of 1D-Structures in Images. Talk at the Instituto Tecnológico de Informática (ITI), Technical University UPV, Valencia, Spain, February 19, 2002. D. Keysers and H. Ney. Some Topics in Image Object Recognition. Talk at the Instituto Tecnológico de Informática (ITI), Technical University Valencia, Spain, January 30, 2002. D. Keysers and H. Ney. Models for Image Object Recognition. PhD-seminar presentation at the Lehrstuhl für Informatik VI, RWTH Aachen, Germany, December 21, 2001. D. Keysers, J. Dahmen, and H. Ney. Image Recognition using Statistical Methods and Tangent Vectors. Talk at the Chair of Pattern Recognition and Image Processing, University of Freiburg, Germany, September 7, 2001.
lab course "Data Mining Cup" summer 2007: In April/May 2007 I coached a team of two students who participated in the Data Mining Cup 2007. Marius Renn and Qu Lizhen obtained the places 26 and 27 out of 248 submissions and we were able to reach a very good third place (again!) in the DMC 2007 University Ranking I extracted from the official result listing. lab course "Data Mining Cup" summer 2006: In April/May 2006 I coached a team of two students who participated in the Data Mining Cup 2006. Marius Renn and Qu Lizhen obtained the places 21 and 23 out of 173 submissions and we were able to reach a very good third place in the DMC 2006 University Ranking I extracted from the official result listing. 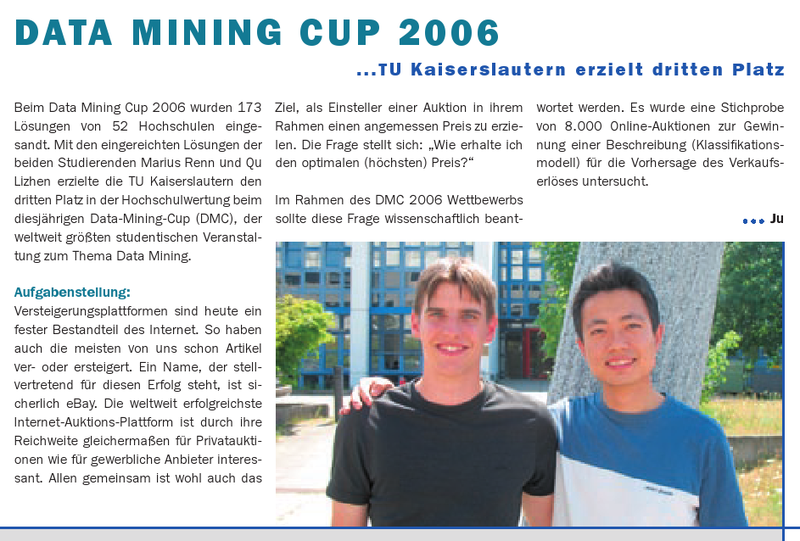 In April/May 2004 I successfully coached a team of students who participated in the Data Mining Cup 2004 together with Thomas Deselaers. The three students won the 1st, 3rd, and 5th place out of 97 participants. lecture notes to the course on "Medical Image Processing" can be downloaded here. results of the GREC 2005 arc segmentation competition (contribution award). the results of the ImageCLEF 2005 Automatic Annotation Task.